Concerto Designs provides website and interactive design, development and optimization services for businesses and non-profit organizations across the country. We specialize in CMS (Content Management System) and Ecommerce platforms including Joomla!, Drupal, Wordpress, CMS Made Simple, Silverstripe, ModX, Magento and XCart. We are fanatics about SEO, security, well-written content, clean code, typography, UI that make smart use of AJAX/Flash widgets, and Open Source solutions. Clients range from Fortune 500 corporations to non-profits and small businesses. In addition to website design, we also provide other graphic design services (logo, product labels, branded literature) and Adwords management. Call (763) 786-9415 (o) | (612) 819-5089 (m) | or email us for more information. 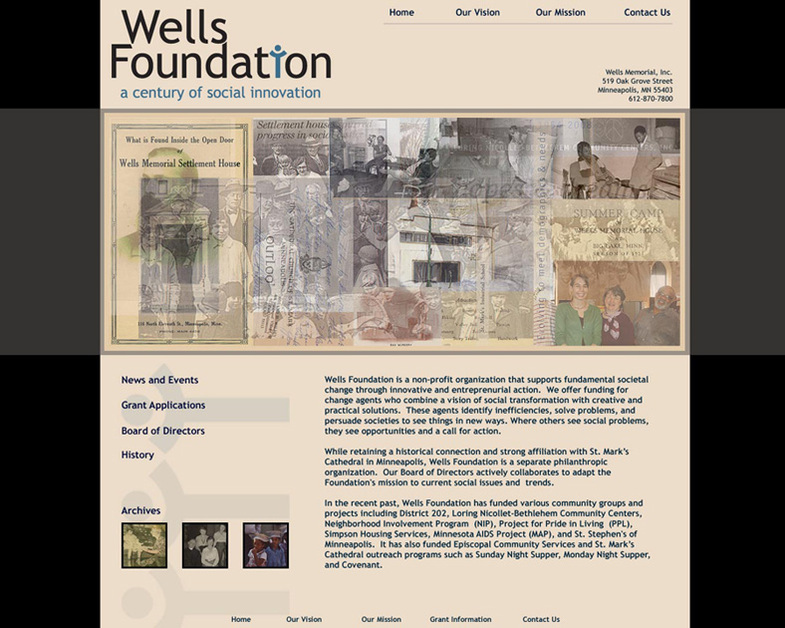 Design for The Wells Foundation: www.wellsfound.org. Header image made from archival photos that I researched and edited.